If you live in Melbourne, then you probably know that last Saturday was Emirates Stakes Day, the last day of the Melbourne Spring Racing Carnival. I went with Bf-F and some friends and had an awesome time. It was the perfect day for it: 30 degrees (or 85F), super sunny with not a cloud in the sky. Bliss. But all was not so tranquil a mere 12 hours before..
You see, I’d agreed to do the catering for my sister’s friend B and 50 of her friends (including my sister), as well as for Mother-K’s friend L (for whom I made the chocolate tart) and her family of 10. Rather than creating two separate menus, Miss B and I devised a menu over email which then dictated what I would make for Miss L. As Miss B had also organised to have sandwiches and hot food delivered to her spot in the Nursery, so she decided she wanted 4 different items with 80 pieces of each. To make things easy, I decided I would round it up to an even 100 and make 20 pieces of each for Miss L.
Miss B requested Arancini (or risotto balls), leaving the flavouring to me. I had made Mushroom Arancini successfully in the past and knew they went down well, appealing to both vegetarians and meat eaters alike. I won’t lie, they are a pain to make, as you have to make a big batch of risotto and allow it to cool before rolling it into balls, crumbing them and deep frying the balls in batches. But I must say they did look good when they were done. I chose to serve these with a tomato relish which I bought to save myself the headache. 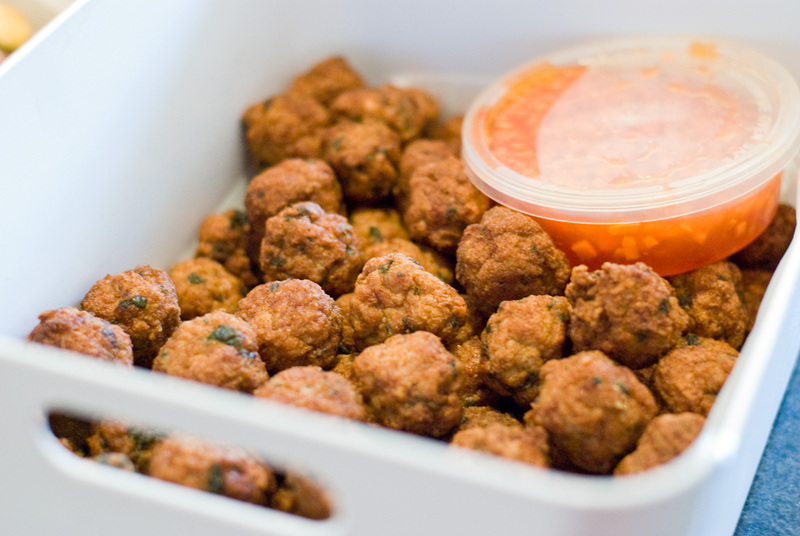 Miss B was also keen to have Thai chicken balls, which I chose to serve with a sweet chilli sauce I made, though bottled would do equally well. I’d seen a recipe once-upon-a-time somewhere that combined chicken mince and Thai curry paste which was then rolled into balls and deep-fried to give an even browning, however, as I couldn’t find the recipe I just made it up, which turned out quite successfully. 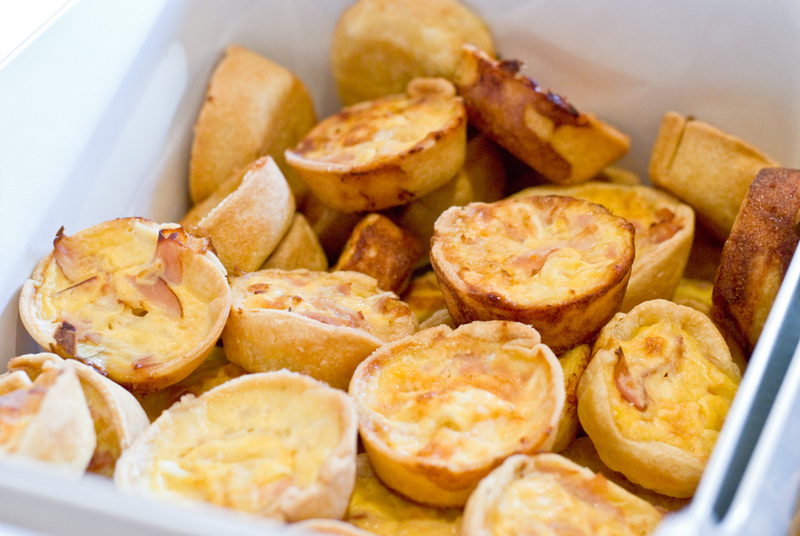 Miss B then chose mini quiches with two different fillings – lorraine (ham and cheese) and spinach and feta. Given I had the Tuesday before off work for the main Melbourne Cup day, I decided to save some money and make the pastry for them from scratch, which I rolled out and cut into circles before freezing them between sheets of baking paper. This made things a lot easier come Friday, as all I had to do was thaw the pastry out before pressing the circles into muffin holes, blind baking them, and filling them with the two fillings. And finally, Miss B left the last choice to me. 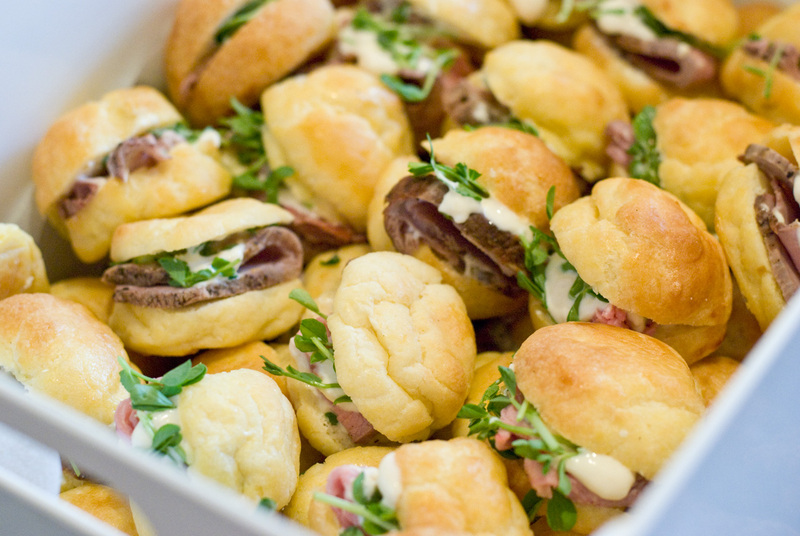 I’d come across a recipe for choux pastries stuffed with roast beef a while ago in Delicious magazine that I had been dying to try ever since. This was the perfect opportunity I thought, and so I made the pastries on the Tuesday as well and froze them, thawing them out on the kitchen bench on Friday. I decided I would stuff half with roast beef and horseradish aioli, and the other half with caramelised onions and feta for the vegetarians. I um’d and ahh’d about whether I would buy the roast beef or make it myself, but eventually decided making my own would taste the best. The original recipe called for mixing the horseradish with cream instead of an aioli, however, as it was a hot day I decided an aioli might hold up better in the heat. On top of that, Miss L also requested some sandwiches. I have long been making chicken sandwhiches from a recipe my Grandmother J passed on to me which combines roast chicken with mango chutney for sweetness and celery for added crunch. But when I ran out of bread and was short 2 sandwiches, I made a couple from an extra baguette I had on hand to make up the numbers. I also made some ham baguettes for Miss L, which I filled with rocket, pesto, roast capsicum, mozzarella and ham. As they wouldn’t stay shut, I tied them with kitchen string which ended up looking quite pretty I thought. So after devising the menu, writing out a massive shopping list and getting my recipes in order, I took Friday off work and spent the entire day cooking. I then had to be up at 6am Saturday to prepare a few last-minute items: the choux pastries had to be filled on the day to ensure they wouldn’t go soggy, and at 7AM when the doors opened, I ran down to the bakers and bought some fresh bread for my sandwiches. Thankfully I got it all done before Miss B arrived at 7.30AM and Miss L at 8.30AM. Miss B had provided me with some tubs from IKEA to put her food in, while I used a few large orange boxes I had on hand for Miss L’s (which just happened to match her orange outfit!). I would have loved to have gone back to bed at that point but I then had to clean my kitchen and get ready for the races myself! Needless to say I was pretty tired come about 9PM.. But it was well worth it in the end as I was really happy with how everything turned out! Combine butter, salt and 3 cups (750ml) water in a large pan (I used a 26cm casserole dish) over medium-high heat. Bring to the boil, then add flour and stir until the mixture comes away from the sides of the pan in a ball. Remove pan from heat. Whisk in 12 eggs, a couple at a time until you have a smooth mix. In batches, drop 100 x 4cm balls of mixture onto lined trays, leaving room to expand. Beat milk with remaining eggs and brush a little over each. Bake for 20 minutes until puffed and golden. Place puffs on a rack and cool completely. 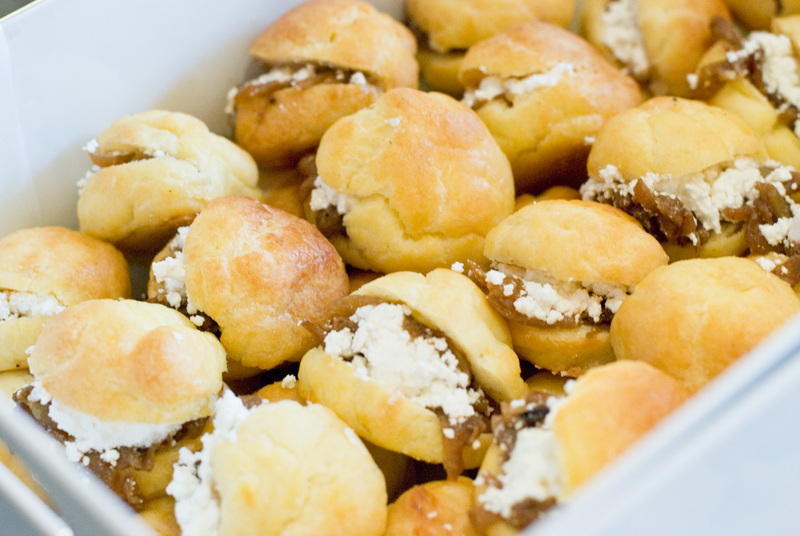 Keep choux puffs in an airtight container for 1 day or freeze ahead and reheat in oven, allowing to cool before filling. To serve, split choux puffs through the centre, not all the way through. Fill half with roast beef, aioli and a few snow pea sprouts. Fill the remaining puffs with a little caramelised onion mixture and top with crumbled feta. Rub beef with a little olive oil. Season generously with salt and pepper. In a frying pan over medium-high heat, seal beef on all sides until browned, about 3-5 minutes. Place meat in a moderate oven and cook for 30 minutes until medium-rare. Remove from oven and allow to cool completely. Place meat in the freezer for an hour to firm up, making it easier to slice. Remove from freezer and using a very sharp knife, slice meat as finely as possible. Divide into 50 portions and set aside. Refrigerate until needed. For horseradish aioli, in a food processor, process eggs, garlic, lemon juice, mustard and horseradish until combined. With the motor running, in a steady drizzle pour in canola oil until aioli is thick. Season to taste. Refrigerate until needed. In a large pan over moderate heat, fry onions in olive oil until dark brown, about 20 minutes. Stir through vinegar and butter until butter melts. Season with salt and pepper. Allow to cool. Refrigerate until needed. Using your fingers, finely crumble feta. Refrigerate until needed. Begin by making the pastry. In a food processor, process flour, butter and eggs until it appears like fine crumbs. Add enough cold water, a little at a time, until mixture clumps together (you may not need it all). If your food processor is small like mine, you may need to do this step in two batches. Just divide the quantities in half. Tip pastry out onto a lightly floured bench and knead until it comes together. Divide dough into 4 equal portions and flatten each into a disk. Cover each with cling wrap and rest in the fridge for half an hour. Working with one portion at a time, roll pastry out flat to 2-3mm. Cut 25 x 12cm circles from each portion and place between layers of baking paper. Press together any off-cuts of pastry and roll out again to create more circles. Cover circles while you repeat with remaining pastry portions until you have 100 circles. At this stage you can freeze the pastry to use later on. Allow to thaw completely before proceeding. 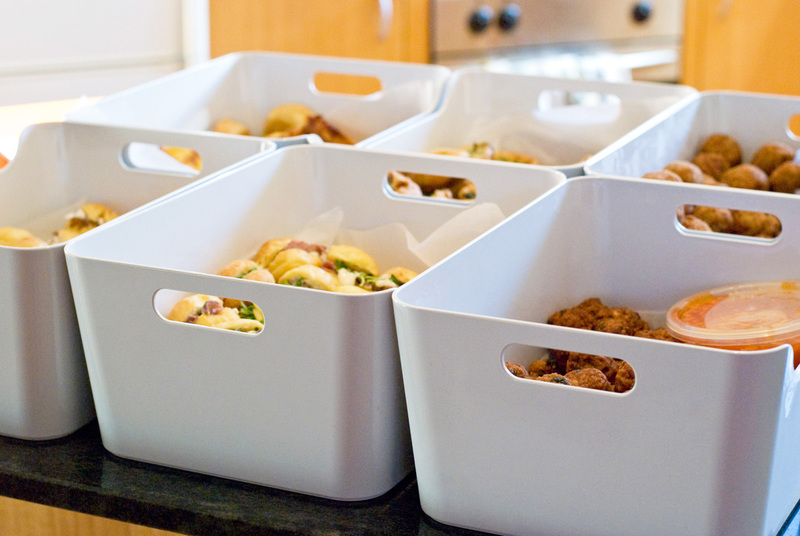 Press 24 pastry circles into 2 x 12-hole muffin tins. Place in a hot oven and bake for 10 minutes until beginning to puff up. Remove from oven and fill each with the prepared fillings. Place back in the oven for another 20-25 minutes until beginning to brown. 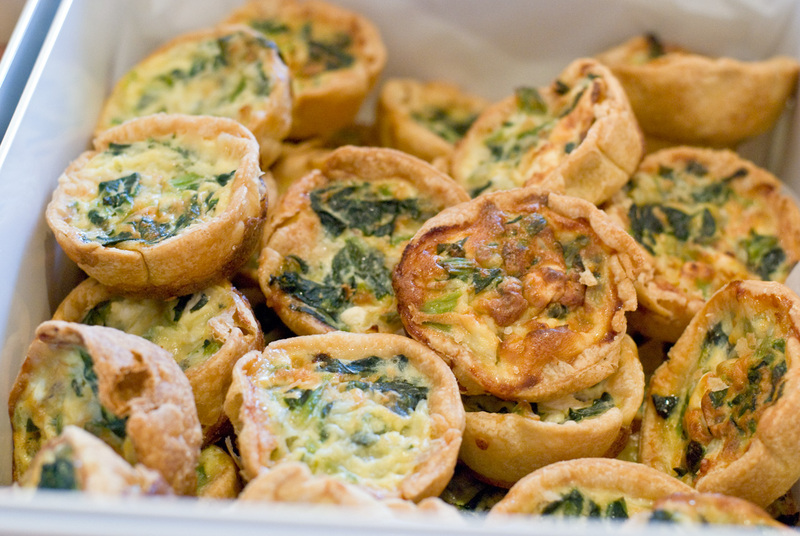 Remove quiches from trays and allow to cool completely on oven racks. Repeat process until you have 50 quiches with lorraine filling, and 50 quiches with spinach and feta filling. In a frying pan over medium heat, fry onion in olive oil until translucent, about 5 minutes. Add garlic and fry for another minute. Stir through ham until beginning to brown, about 3 minutes. Remove from heat and allow to cool slightly. In a large bowl, whisk together eggs, cream and cheddar until well combined. Stir in onion mixture and season to taste. In a frying pan over medium heat, fry onion in olive oil until translucent, about 5 minutes. Add garlic and fry for another minute. Stir through spinach and cook until moisture has evaporated, about 5 minutes. Remove from heat and allow to cool slightly. In a large bowl, whisk together eggs, cream and cheddar until well combined. Stir in onion mixture and crumble in feta. Season to taste. In a large bowl, combine chicken mince, curry paste, coriander, flour and salt. Divide mixture into 4 and roll 25 balls from each portion. Heat oil in a deep saucepan until just beginning to smoke. To check if it is hot enough, drop in a square of bread and check if it sizzles. 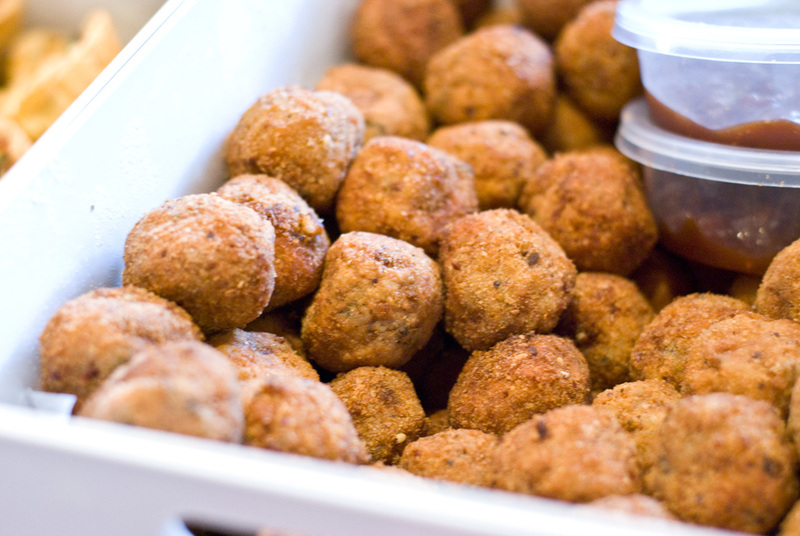 Fry chicken balls in batches until golden and cooked through, about 5 minutes. Drain on absorbent paper. Serve hot or cold with sweet chilli sauce. You may need to divide this one over 2 large casserole dishes. You may also want to make it over two days, cooking the risotto on the first day and making the balls the next. Fry onions in olive oil until translucent, about 5 minutes. Add garlic and fry until fragrant, about 1 minute. Add rice and mushrooms and stir to combine. Pour in white wine and bring to the boil. Cook until the rice absorbs all the liquid, stirring continuously. Add chicken stock a litre at a time, stirring continuously, cooking until the rice has absorbed all the liquid before adding the next lot. Once the rice is cooked, stir through the grated parmesan and remove from heat. Allow to cool completely. Once cooled, divide mixture into 4 and with wet hands roll 25 balls from each portion. Place flour, breadcrumbs and eggs into 3 large, separate dishes. Wisk eggs with the milk. Dip each risotto ball into the flour, then egg mix, and finally the breadcrumbs. Fry balls in batches until golden, about 3-5 minutes. Drain on absorbent paper. Serve hot or cold with tomato chutney. Pull chicken meat from the carcass, checking carefully from bones. Chop finely and combine with mayonnaise, chutney, celery and onion and season with salt and pepper to taste. Butter bread a spread half with some of the chicken mixture. Top with remaining slices and trim off crusts. 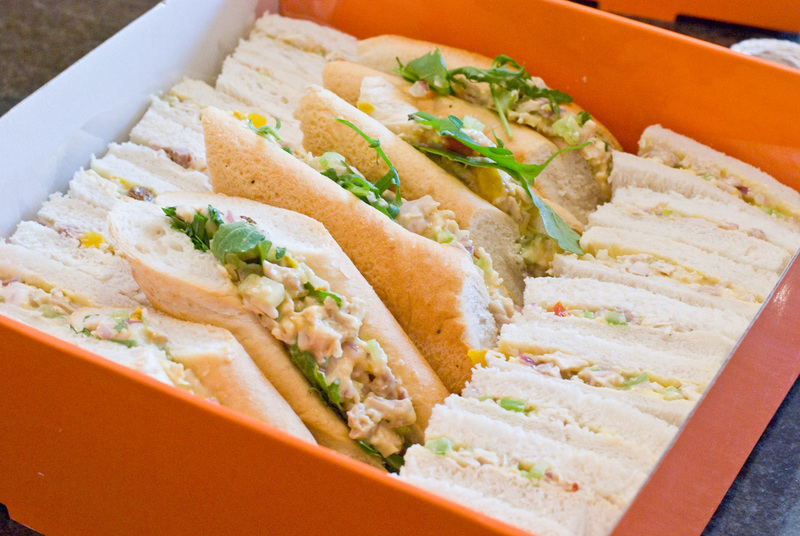 Cut sandwiches in half horizontally and serve. Trim ends off baguettes. Slice in half horizontally, almost all the way through. Open up baguette and butter. Spread some pesto over each baguette. 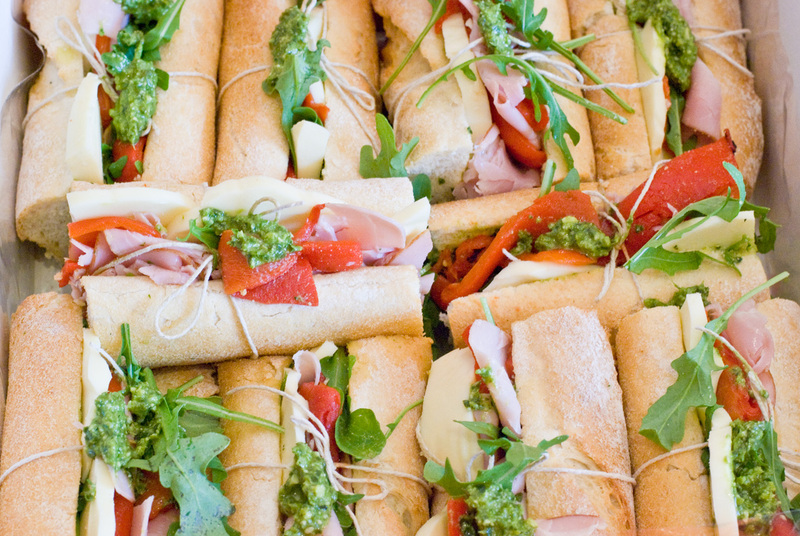 Fill baguettes with rocket leaves, mozzarella, ham and capsicums. Using kitchen string, tie each baguette shut at 5 evenly spaced intervals, leaving half the space at each end. Cut each baguette into 5 between each string. Garnish with a few extra rocket leaves and serve. Thanks Miss T! I think catering for 10 can be just as difficult though since you can make something a bit more complicated..
Glad you liked the post since a lot of effort went into it! 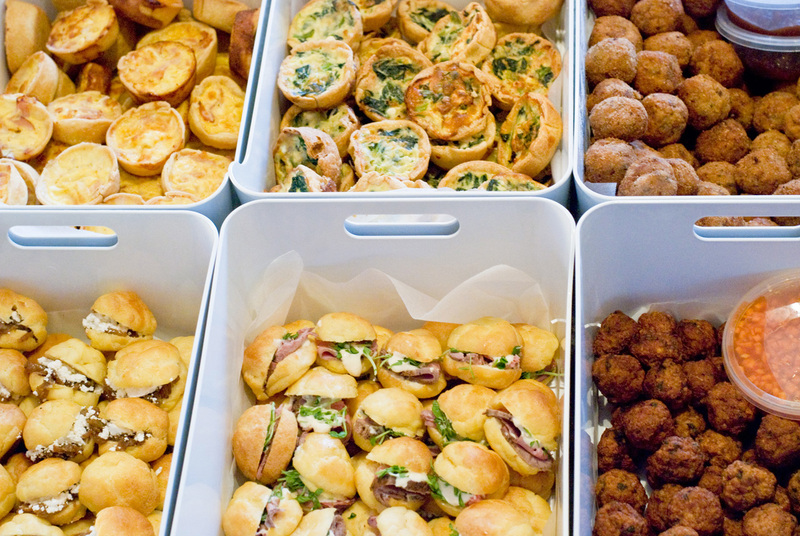 Check out my 2012 post for some more ideas (http://melbournefoodfiles.com/2012/12/06/races-catering-2012/).